J. Birney Crum Stadium has long been a favorite stop on the annual DCI Summer Tour. 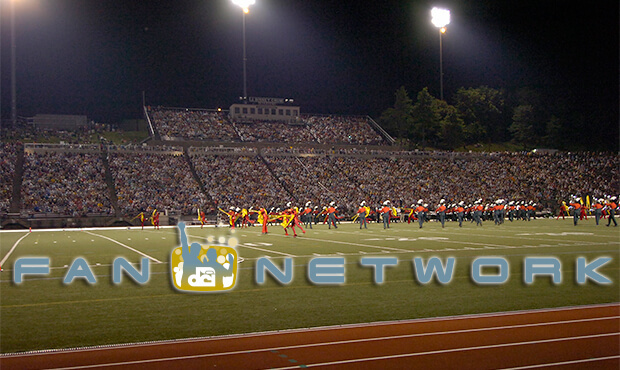 For the first time in history, the Drum Corps International Fan Network will webcast both nights of the 2014 DCI Eastern Classic, Friday, Aug. 1 and Saturday, Aug. 2 live from Allentown, Pennsylvania. Longtime home of the DCI Eastern Classic (formerly known simply as DCI East), historic J. Birney Crum Stadium is a 66-year-old venue in eastern Pennsylvania that has hosted DCI competitions since 1977. "With recent upgrades including a new Internet line run to the stadium's press box, this is the first time webcasting from J. Birney Crum Stadium has been a reality," DCI Executive Director Dan Acheson said. "As one of the older stadiums on the DCI Tour, we're not entirely sure that the delivery of this first-time webcast won't come with a few hiccups along the way, but we're excited to give it a go and let fans who can't make it to the stadium experience one of the most venerable annual event series of the summer. " Not previously scheduled, the two days of live webcasts will be an addition to all current Fan Network subscribers at no charge. Those wishing to check out either night of competition can also do so on a pay-per-view basis for $19.95 each day. DCI Eastern Classic J. Birney Crum Stadium Allentown, PA Friday, August 1 5:00 PM - Gates Open 5:45 PM - Xcape Dance Ensembles 6:30 PM - Crimson Kings SoundSport team 6:47 PM - Cavalcade of Bands Honor Band 7:04 PM - Pioneer 7:21 PM - Cascades 7:38 PM - Oregon Crusaders 7:55 PM - Pacific Crest 8:12 PM - Colts 8:29 PM - Intermission - 17 min. 8:46 PM - Blue Stars 9:03 PM - Blue Knights 9:20 PM - Boston Crusaders 9:37 PM - Phantom Regiment 9:54 PM - Santa Clara Vanguard 10:11 PM - Blue Devils 10:30 PM - Awards Ceremony Saturday, August 2 5:00 PM - Gates Open 6:20 PM - Welcome/Anthem (Old Guard Fife and Drum Corps) 6:47 PM - Defenders 7:04 PM - Jersey Surf 7:21 PM - Mandarins 7:38 PM - The Academy 7:55 PM - Spirit of Atlanta 8:12 PM - Troopers 8:29 PM - Intermission - 17 min. 8:46 PM - Crossmen 9:03 PM - Madison Scouts 9:20 PM - Carolina Crown 9:37 PM - The Cavaliers 9:54 PM - Bluecoats</strong 10:11 PM - The Cadets</strong 10:28 PM - Bridgemen Alumni</strong 10:50 PM - Awards Ceremony Eastern time zone. All times approximate and subject to change. Two ways to view these webcasts are available. A $19.95 pay-per-view option for each night of competition will give you one-time access to watch either night of performing corps in Allentown. Choose the $69 Live subscription option, or Live+DVD or Live+Blu to gain complete access to all of this summer's live webcasts, on-demand replays of select DCI Tour events, discounts on downloadable media, and more!